Some fun things have been happening at Holy Cross lately. We celebrated 100 days of school, and our younger students got to work with another robot called Kibo thanks to the DCIU’s STEM Lending Library. Check out some of the fun in the slideshows below! Thanks to the Delaware County Intermediate Unit’s STEM Lending Library Mrs. Eisenman was able to borrow Dash and Dot Robots for two weeks. The students used them during technology class and had a great time. You can see some photos and videos below of the classes using the robots. We had a lot of fun during Catholic Schools Week. We had a career day, a pajama drive, an animal show, ice cream sundaes and fitness day. You can see some slideshows from those events below. During Catholic Schools Week our 3rd to 8th grade put on a talent/karaoke show for each other to celebrate Student Appreciation Day. A few of our teachers even got into the fun and performed. Enjoy this slideshow of pieces of the performances! All hot lunch orders will now be done online this year. 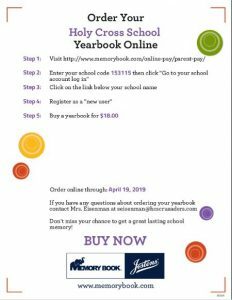 Please refer to our Cafeteria News and Menus Page (under the Current Families tab) for the link to order online. Please check the immunization information on our PIC page under the Current Families Tab to ensure your child is up to date with the new requirements. questions regarding uniforms, please contact school at (610) 626-1709.